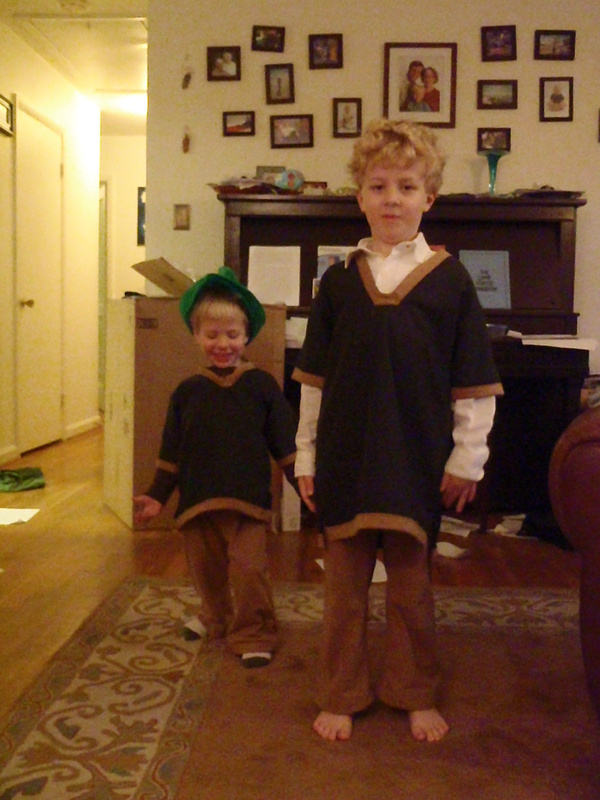 I took time out from my Christmas Show production to make both boys’ Halloween costumes. I didn’t think I’d have to make E’s this year, but the school not only put an “absolutely, positively no superhero characters at the school Halloween party” clause in the newsletter they also demanded that the costumes be historical figures or literary characters. After explaining that, yes, Captain America did have his own book, but, no, that did not make him “literary” he settled on Robin Hood. 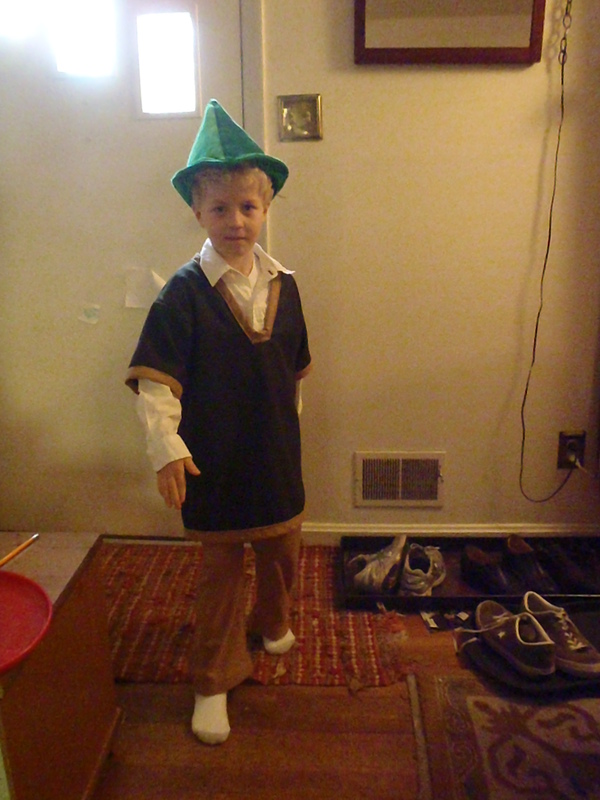 Amazon.com has about 300 different children’s Robin Hood costumes, but the newsletter from the school also said that the costume could not be “store bought” and should be put together “at home.” Not hand sewn, but somewhat homemade. Well, given the costumes I’ve made in the past I couldn’t NOT hand sew his costume. I went to G Street Fabrics, a great fabric store that carries clothing and upholstery fabrics as well as quilting cottons. And they have an amazing remnant section. I took E with me to make sure that I got the “right” colors. And let me add that outside an ill-fated attempt at a pair of shorts during 8th grade home ec I have never made pants. Those shorts went so badly I never had the courage to actually make a real pair of pants again. Until I found a children’s pants tutorial at http://www.dana-made-it.com. 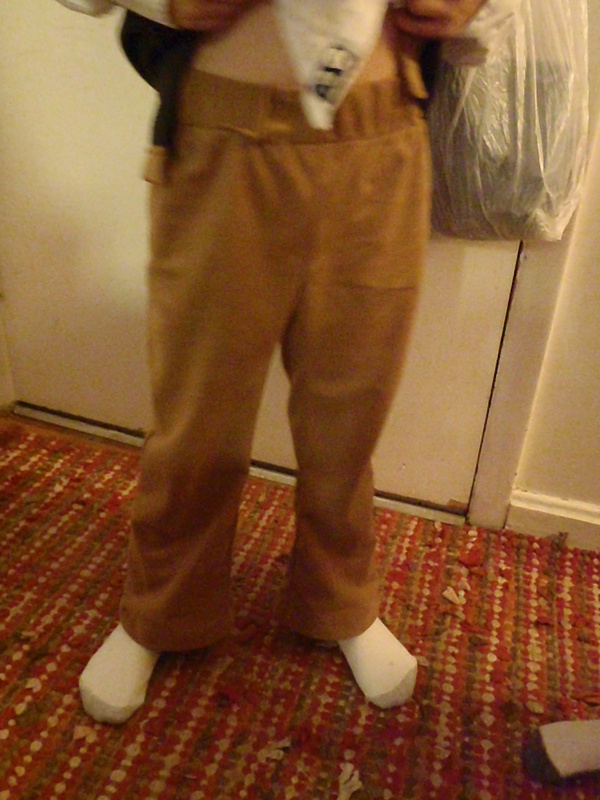 She made it seem so easy to make an elastic waisted pant that I couldn’t help but try it. Especially since I found a great tan pseudo-suede fabric for $2.97/yd. And these pants would only take a half a yard! With the cost of the elastic figured in I could have a chance at greatness (or have another chance to learn from failure) for under $3!! That’s less than a Grande Pumpkin Spice Latte at Starbucks, people. 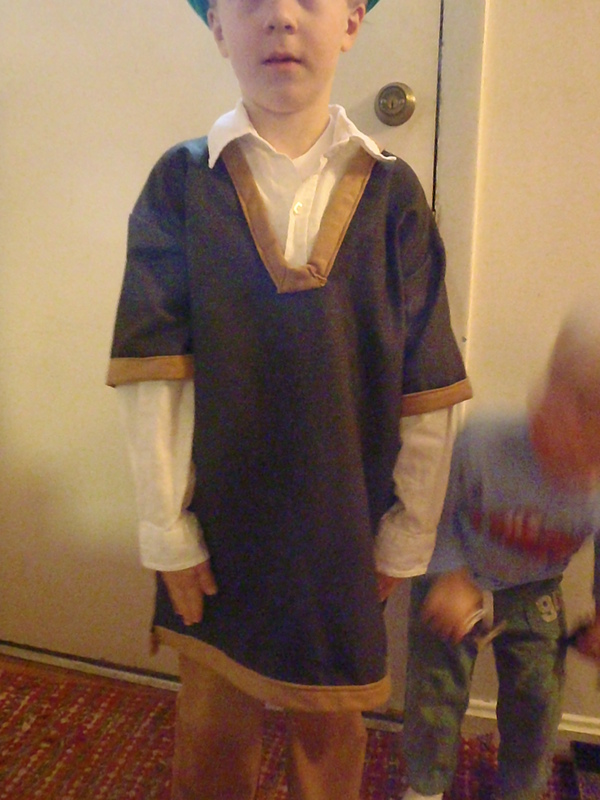 And then I needed to make a tunic. I did some research on what a typical Robin Hood costume looks like by watching Disney’s Robin Hood and looking at pictures of Errol Flynn (he was kind of dreamy in a 1940s movie icon sort of way). Here’s what I came up with. 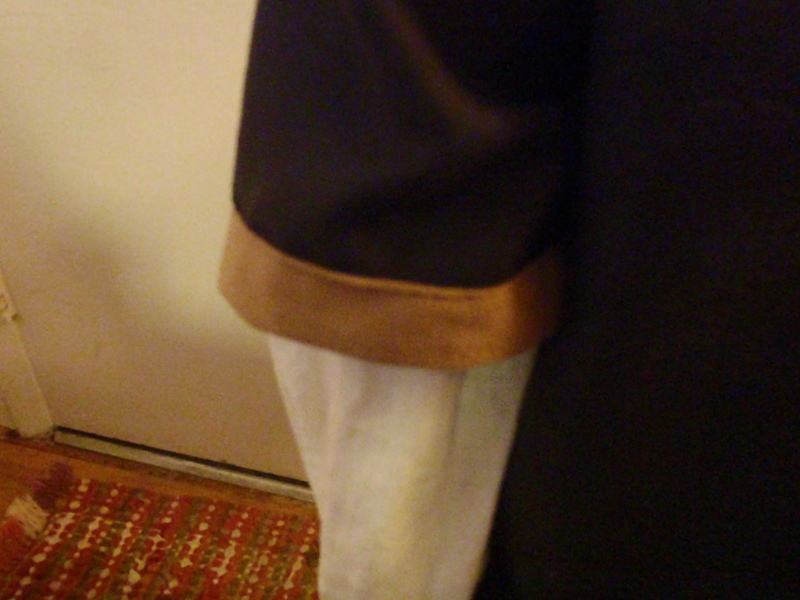 Trim detail - same faux-suede material as the pants. The green is a suit-grade wool that was definitely NOT .97/yd, but it was worth it. Halloween was going to be chilly and I wanted him warm. Plus he and I didn’t like the other colors of fabric available. E thought they weren’t “woodsy” enough. I took a larger shirt and kind of traced it on newspaper to make up a pattern and, to my immense surprise, that actually kind of worked! The sleeves were tricky, but I managed and they didn’t pucker or look crooked or sloppy. All I can say is that I used 1 pin per half inch to hold those sleeves in place. Throw on a white dress shirt underneath and here’s what we got. Robin Hood! He looks just like Errol Flynn, doesn't he? 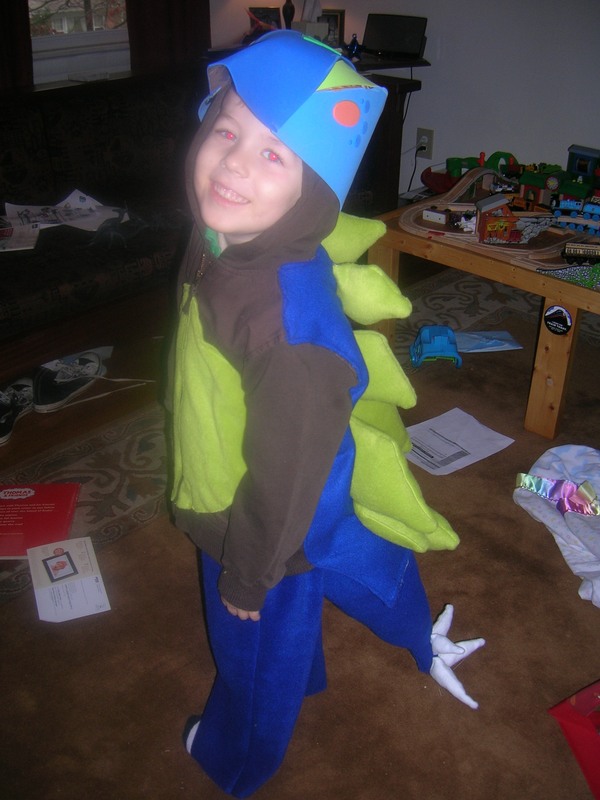 E was so happy about his costume he insisted that I make one for H, too and call him Little John. 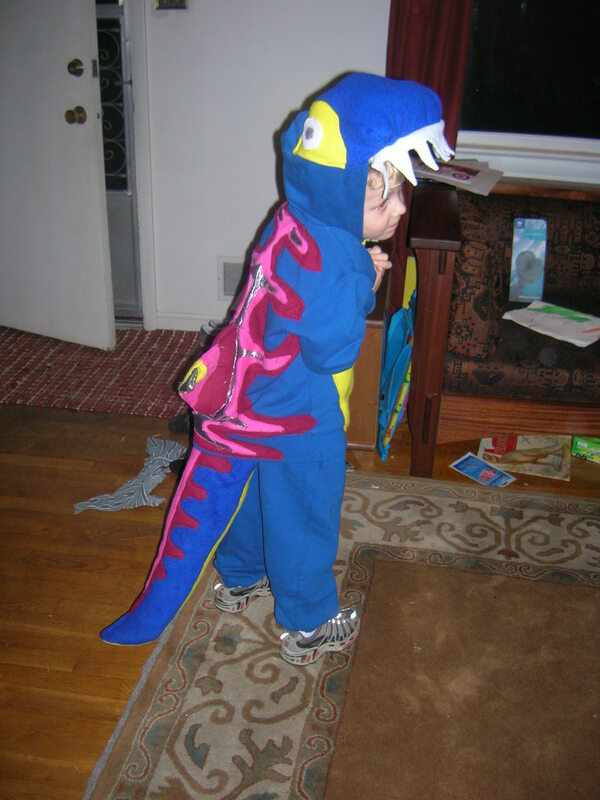 And for his Aunt Michelle, a picture of him in the costume you sent. 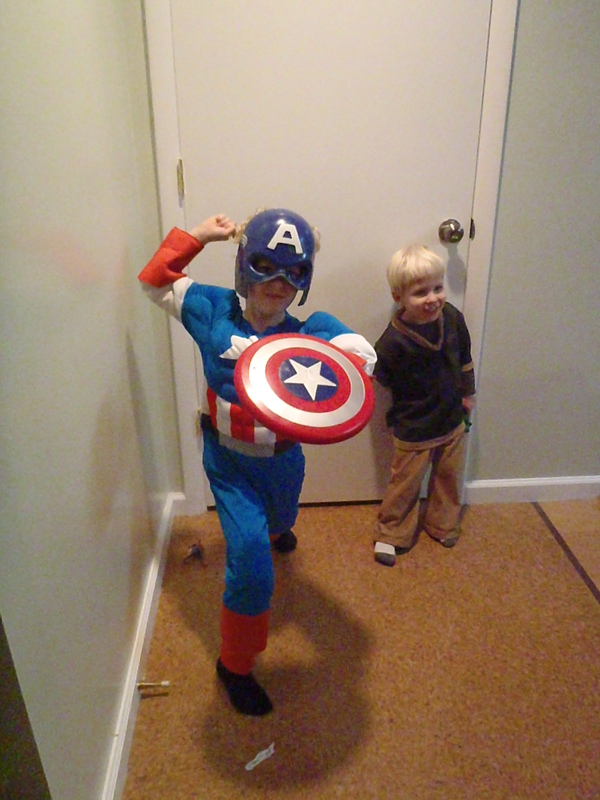 Captain America and his side-kick Little John! Thelma and Louise Ride Again! Yea, mom! How cute and well done! I got pictures of them to send to A. They were SO proud of their costumes when they came over. You done good. Nice! And now I’ll have that damn Roger Miller song in my head all day!